The most retweeted tweet ever? 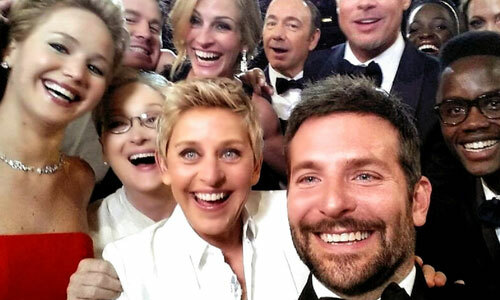 Ellen DeGeneres’ star-studded selfie from the 2014 Academy Awards featuring Bradley Cooper, Lupita Nyong’o, Jennifer Lawrence, Brad Pitt, Kevin Spacey and half a dozen other extremely famous people. Defined by Oxford Dictionary as “a photograph that one takes of oneself, typically with a smartphone and shared via social media”, nearly 300,000 million #Selfies have been shared on Instagram, with up to 365,000 mentions on Facebook in any given week. Yes, it’s seems narcissistic; however it’s no longer a social phenomenon but an ingrained trend that relentlessly prevails in modern society. What better place to start than with the Queen of social media? After publishing a book composing of nothing but selfies, Kim Kardashian has spent countless interviews discussing her plight in finding the best angles for a photo. And it turns out, it’s all about keeping your chin down and holding the camera angled higher than face level, ensuring your features appear more streamlined. Skim the internet and you’ll find a myriad of articles on what not to do in a selfie or how to take a selfie like a supermodel, featuring step by step guides on working your front-facing camera. Accentuate your best features with filters that highlight you in all the right places. Locate the most flattering lighting; avoid overhead or over-exposed. Look directly into the camera. But if those pointers weren’t quite enough, the selfie is now generating technological innovation with the world’s first automated selfie stick. Extending on its own, it features a set of ‘beauty lights’ (a favourite of Kim K’s) that extend from the back of the iPhone holder and even has fan attachments that you can optionally use to achieve the perfect ‘windswept’ look.